Warren Holifield was 8 when he began cooking alongside his grandma, Madge Frye, in his hometown in Putnam County, Fla.
After a 20-year career as a quartermaster in the U.S. Navy, Holifield was preparing for a second career at Tidewater Community College, studying Computer-Aided Drafting and Design and planning to work with a local shipyard. “The job fell through, so I was at a crossroads again,” he said. 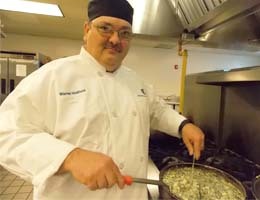 “It was then that I decided to do what I’ve always wanted to do – become a professional chef. Holifield says he works long hours, but enjoys everything about his new career. “I have a good boss and work with a good team. I look forward to getting up and going to work every day. TCC is a family affair for the Holifields, with Warren’s wife, Robin, studying accounting and his daughter, Kelly, working toward a degree in administrative support technology. His older daughter, Darcie, works with her dad at Primo.